The Cambridge Audio Minx Go is a pint-sized version of the Minx 100, but can it compete with the likes of the Jawbone Jambox, Damson Oyster, and Jabra Solemate? Portable Bluetooth speakers are ten-a-penny these days and with prices varying wildly it can be difficult to know where to start. Budget designs boast smart features, but sound awful while premium products sound the business but cost as much as a hi-fi. With the Minx Go, Cambridge Audio is threatening to bridge the divide with a compact, great-value speaker overflowing with audio expertise. If you've been lucky enough to get hands on with the larger Minx 100 you'll already know just how well made the Minx Go is. Measuring W235 x H120 x D60mm the metal speaker grille fits perfectly with the robust gloss white (Black also available) casing and for the price we'd not be surprised to find the occasional factory-finished rough edge, but the Minx Go is flawless. The size and weight (just over 1kg) sits the Minx Go somewhat awkwardly between bookshelf and travel speaker. Great for taking room-to-room, but a little large for the luggage, but it's not a problem exclusive to the Minx Go and a bit of heft is the price to pay for proper audio quality. Admittedly the design is safe rather than striking, but in a world dominated by primary-coloured, rubberised cubes you could argue it's refreshingly grown-up. 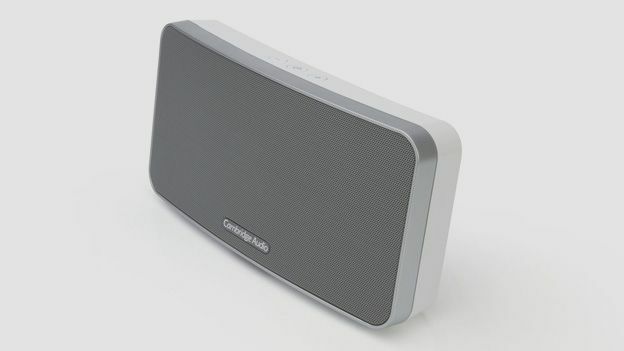 Cambridge Audio has kept it simple with a basic Bluetooth connection - press and hold the power button to synch - and the usual 3.5mm line in for traditionalists. Range is pretty standard, too with signal starting to splutter at around 10m. There's also a USB port for charging, but annoyingly the Minx Go needs to be plugged into the mains first so you can't boost your phone battery when out and about. Slightly ironic that your smartphone will run out of juice well before the speaker so it's just as well the Minx Go can remember up to eight other devices. Considering the Minx Go isn't a pocket sized chuck-in-the-bag travel speaker, the 18hr battery life is nothing short of miraculous. And what's more it takes just two hours to fully charge. You'll not find better for the money, or for that matter double the money. The £250 Big Jambox manages a second place 15hrs while the Bose SoundLink II and countless other designs limp to around 8hrs. Cambridge Audio has a long history of producing great-sounding kit that doesn't cost silly money and the Minx Go is no exception. With five speakers - two titanium, tweeters, two 2in woofers and rear-mounted Bass Radiator - and some pretty sophisticated digital signal processors the Minx Go performs on a par with many designs twice the price. It can't compete with the Big Jambox for brute volume, but what you lose in loudness you make up for with distortion-free listening whatever volume. We were really impressed with the balance of the sound mix and while some vocals, especially on acoustic tracks, force their way to the front, on the whole it performs far better than expected for just £99. That said the Minx Go did sound better with the volume turned up. The oversized Bass Radiator cleverly integrated in the back of the casing, doesn't do much at the quieter end, but once turned up the bass rumbles and kick-drum thumps with surprising authority. For such a small unit we were impressed with its ability to throw sound to all corners. Don't expect it to be the main stereo at a party, but it is ideal in the office, bedroom or on the patio. Whether you want a go-anywhere speaker with unbeatable battery life, or a high-class radio replacement you'll not find better than the Minx Go for the price. We hope Cambridge Audio has done its maths properly because at £99 its undercutting all comers with a Bluetooth speaker that refuses to compromise on build quality or audio performance.